Personal tracking tools -- technologies that meticulously count our daily steps, map our runs, account for each purchase - fall in and out of favor in users' lives. People abandon self-tracking for different reasons, University of Washington researchers have found. Some don't like what their Fitbit or financial tracking tools reveal, others find collecting data a hassle, don't quite know how to use the information or simply learn what they need to know about their habits and move on. "We got curious about what it's like for people after they stop using self-tracking tools," said Sean Munson, a UW assistant professor of human centered design and engineering. "Do they feel great, do they feel guilty, do they feel like they've gotten everything they need?" In research presented earlier this year that surveyed 193 people who had abandoned personal informatics tracking, the team found many people experienced no real difference in their lives. Other emotions, however, ranged from guilt over not being able to keep it up to relief from the tyranny of self-tracking. Now, in a paper to be presented Sept. 15 at the Association for Computing Machinery's 2016 International Joint Conference on Pervasive and Ubiquitous Computing (UbiComp 2016), the researchers explore how different design approaches may better support people who have lapsed in their Fitbit use. "People feel more guilt when it comes to abandoning health tracking, as compared to something like location tracking, which is more of a fun thing that people do for a while and move on from," said lead author Daniel Epstein, a UW doctoral student in computer science and engineering. "We definitely don't think that everyone should be tracking forever, but we wanted to see if there are design opportunities to better support people who have had different experiences using Fitbit." 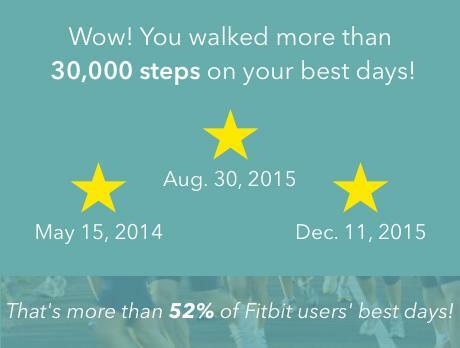 The research team surveyed 141 people who had lapsed in using Fitbit. They showed the subjects seven different visual representations and ways of framing previously collected data, to see if the data could offer additional support and encouragement to be healthy if portrayed in new and interesting ways. Half of these Fitbit users described feeling guilty about their lapsed Fitbit use, and nearly all of those said they would like to return to activity tracking. Twenty-one said they got no value out of tracking, found it annoying, or struggled to connect the data to behavior change. Five participants felt they had learned enough about their habits, and 45 reported mixed feelings about abandoning their Fitbit. The researchers found that lapsed users responded differently to seeing their old Fitbit data presented in new ways, depending on their personal tracking history. Participants who had tracked their fitness levels for less than four months preferred visualizations that showed them which days of the week or time of day they were active, while those with a longer track record preferred visualizations that highlighted the length of their activity record. Most people preferred social comparisons that made them look better than their peers, such as "you walked more than 70 percent of people," over those that were framed negatively, such as "30 percent of people walked more than you" - even if the comparisons represented the same information. 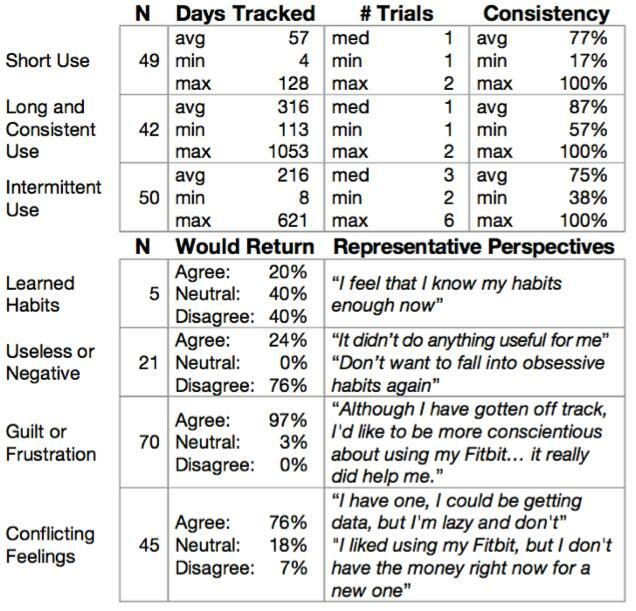 The team also found that people who felt guilty about abandoning their Fitbit use were very receptive to recommendations that they return to tracking, while people who felt they had gotten what they had wanted out of self-tracking felt those same suggestions were judgmental and unhelpful. The responses show, researchers say, that a one-size-fits-all design approach misses opportunities to support different types of users. "Right now self-tracking apps tend to assume everyone will track forever, and that's clearly not the case," said co-author James Fogarty, a UW associate professor of computer science and engineering. "Given that some people feel relief when they give it up, there may be better ways to help them get better value out of the data after they're done, or reconnect them to the app for weeklong check-ins or periodic tune-ups that don't presume they'll be doing this every day for the rest of their lives."